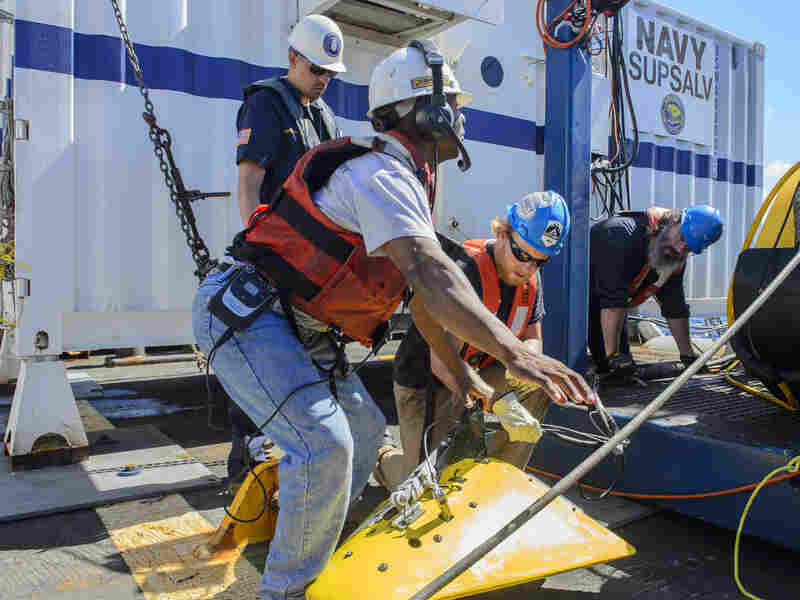 El Faro Wreckage Is Identified Off The Bahamas : The Two-Way A U.S. Navy search crew located the cargo ship, which went down a month ago during Hurricane Joaquin with 33 people aboard, using sonar equipment. Investigators onboard the USNS Apache retrieved the tow pinger that was used to look for El Faro's voyage data recorder on Oct. 24. Although the wreckage of the ship has been found, the recorder is still missing. U.S. Navy investigators have found the wreckage of the cargo ship El Faro, which sank off the Bahamas during Hurricane Joaquin with 33 people aboard, the National Transportation Safety Board has confirmed. The U.S.-flagged ship was located after a week of searching by a crew from U.S. Naval Sea Systems Command, using sonar equipment. It appears to be in an upright position and in one piece at a depth of about 15,000 feet. Investigators will continue to search the sea bottom, the NTSB said. They are hoping to find the ship's voyage data recorder, which could shed light on what happened to El Faro. The cargo ship left Jacksonville, Fla., en route to Puerto Rico on the evening of Sept. 29. The following afternoon, the captain emailed the company that owns the ship, saying he intended to head south to avoid the hurricane, which was then strengthening. "He reported that there was a hull breach, a scuttle had blown open, and that there was water in hold number 3. He also said that the ship had lost its main propulsion unit and the engineers could not get it going." The ship's last reported position was about 20 miles from the eye of the storm, the NTSB said. Onboard the ship were 28 U.S. nationals and five people from Poland. The owner of El Faro, Tote Services, has come under fire for allowing the ship to sail into the hurricane's path. Several lawsuits have already been filed by families of the crew. CNN reported that the company's president, Phil Greene, has said that the captain's plan was sound, and that the ship would have been able to pass around the storm safely if the main propulsion unit hadn't failed.